This site tells my family story, dating from 1651 to present. The Headrick family name existed in Germany as early as the 13th Century. An old high German name, it was properly spelled "Hadurich," which means "Prince of the Battle." Variations in the spelling of the Headrick name include: Hedrick, Heddrich, Heidrick, Heydrich, Hedrich, and Hetrick. These variations are the result of both phonetic spellings by immigration, census, military, and other record keepers over the years and direct changes in the spelling by Headrick family members themselves. This site traces a Headrick line back to the 17th Century in Langenselbold, Germany. A part of the Holy Roman Empire at that time, Langenselbold still exists today and is located several miles to the northwest of modern Frankfurt, Germany. Headrick family members in this line were also among the earliest settlers in the United States, and they arrived here aboard the sail-ship "Elizabeth" in 1733. 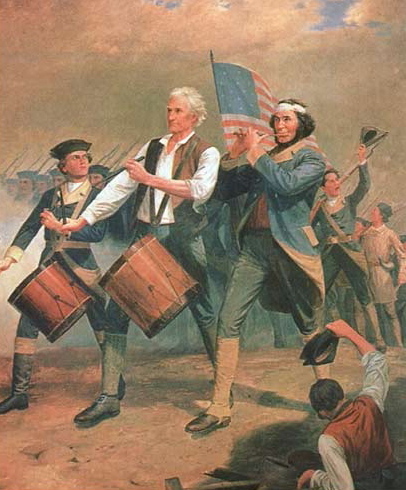 The image above is called "The Spirit of 76," and it exemplifies the life of William Hedrick, a Headrick ancestor in this line that was a fifer in the Continental Army serving under George Washington. William and many of the other Headricks you will read about on this site are buried in Headrick's Chapel Cemetery in Wear's Valley, Tennessee. Headrick's Chapel is a recognized National Historic Site. Twelve Generations of Headricks and Counting!